The name "Châtelet" refers to the stronghold, the Grand Châtelet, that guarded the northern end of the Pont au Change, containing the offices of the prévôt de Paris and a number of prisons, until it was demolished from 1802-10. At the square's center is the Fontaine du Palmier, designed in 1806 by architect and engineer François-Jean Bralle (1750-1832) to celebrate French victories in battle. It has a circular basin, 6 m (20 ft) in diameter, from which a column rises in the form of a palm tree's trunk 18 m (59 ft) tall. The palm trunk is surmounted by a gilded figure of the goddess, Victory, holding a laurel wreath in each upraised hand; the goddess figure stands on a base ornamented with bas-relief eagles. The gilded finial is by sculptor Louis-Simon Boizot. Four allegorical figures also by Boizot ring the base of the fountain: Prudence, Temperance, Justice, and Strength. From top to bottom, bands of bronze gilt pay tribute to the victories achieved in the following battles: The Siege of Danzig (1807), the Battle of Ulm (1805), the Battle of Marengo (1800), the Battle of the Pyramids (1798), and the Battle of Lodi (1796). Its sphinxes were designed in 1858 by Gabriel Davioud and sculpted by Henri Alfred Jacquemart (1824-1896); they commemorate Napoleon's victory in Egypt. Two identical-looking theatres stand facing the square, the Théâtre du Châtelet and the Théâtre de la Ville, both designed by architect Gabriel Davioud and completed between 1860 and 1862 as part of Baron Haussmann's grand reconfiguration of Paris. ^ Jacques Hillairet, Dictionnaire historique des rues de Paris, 8th ed. (Éditions de Minuit, 1985), Vol. 1, pp. 331-34. 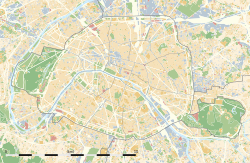 Wikimedia Commons has media related to Place du Châtelet (Paris). This page was last edited on 19 November 2018, at 15:37 (UTC).